In a previous post on March 1, 2012 and again in a later blog we touched on the apparent connection between Lyon & Healy of Chicago, and Oliver Ditson of Boston. If the rate at which drums born of this partnership are showing up on ebay serves as any indication, they must not be all that uncommon. 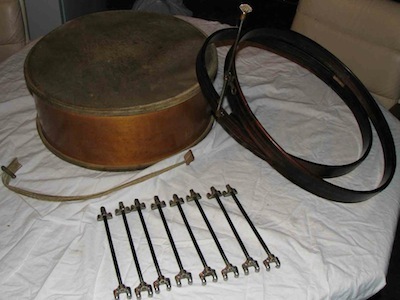 This time a seller located in New Mexico was offering a fairly ordinary single tension drum. The wood shell and hoops are held together by eight early styled single tension rods with claws on either end. The drum is short on detail other than the wooden grommet, the ornamental snare tensioning knob, and it's faux rosewood painted hoops all of which are common on Lyon & Healy drums of the period. The drum drew fourteen bids and was ultimately sold for $102.50 which seems to be on the friendly side of fair. It also reflects the relatively little amount of interest in simple single tension drums of the late 1800s. 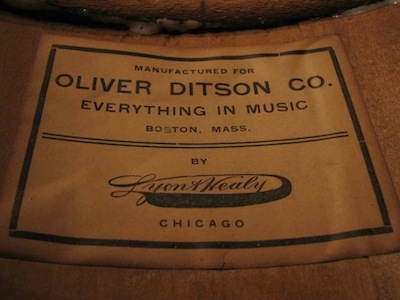 Do you have a drum made by Oliver Ditson? I want to hear from you! Send Lee an email at lee@vinson.net.